Sticking stuff together and having it stay together is an important part of building and repairing boats and boating gear. Finding the right adhesive for the job is super important. G/flex Epoxy is a toughened, resilient two-part epoxy that gives a superior waterproof bond to plastics, metals, fiberglass, masonry, glass and wet and difficult-to-bond woods. It’s a marine-grade adhesive, manufactured by a company that knows boating, and epoxy. G/flex is made by West System, a division of Gougeon Brothers, Inc. The Gougeon brothers have some 40 years of experience in using epoxy to build and repair boats. 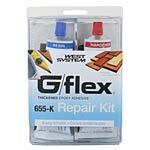 So, with G/flex you’re getting an adhesive specifically designed for the boating community. We strive to give our customers the products they need to succeed in their boating adventures. We have a number of excellent adhesives, including ones for Hypalon® and urethane/vinyl repair. Still, a number of you have asked for adhesives that will adhere to plastics, fiberglass, wood and aluminum and we didn’t have anything to offer you. So, we set out to find products that would work on these very different materials. We assumed we would need several different products to be able to handle all these jobs. Then, we found G/flex Epoxy. Not only did it work on all these materials, but test results showed that it works very well. Something many of you have asked for is to be able to glue D-ring patches to your ABS, polyethylene (HDPE, LDPE) or composite kayaks or canoes. A how-to for that, as well as how-to's on patching various plastics, Royalex™, and even aluminum can be found to the right in Related Articles. At the 2007 International Boat Builders’ Exhibition & Conference (IBEX), G/flex Epoxy won an Innovation Award in the boatbuilding methods and materials category. The presentation was made by the National Marine Manufacturers Association, following judging by members of Boating Writers International. 650-8 Epoxy is 4-ounces each of viscous liquid 650 resin and hardener and complete handling and repair instructions. 650-K Repair Kit includes 4-ounces each of the liquid 650 resin and hardener, plus two reusable mixing stick/applicators, two 12-cc syringes, four grams of adhesive filler (for custom thickening of the mixed epoxy), four mixing cups, a pair of disposable gloves, four alcohol cleaning pads and complete handling and repair instructions. 655-8 Epoxy is 4.5-ounces each of thickened G/flex 655 resin and hardener and complete handling and repair instructions. 655-K Repair Kit is also in kit form, giving you 4.5-ounces each of thickened G/flex 655 resin and hardener, two reusable mixing stick/applicators, four alcohol cleaning pads, a pair of disposable gloves, 10 mixing palettes and complete handling and repair instructions. In each of the above product pages, in the More Information box, we’ve included links to the instruction sheets and sample projects that come with the G/flex Epoxy. They’re very detailed and easy to follow. Toughness and flexibility: G/flex has been “toughened,” formulated to give bonds that can absorb the stresses of expansion, contraction, shock and vibration. It’s resilient, impact resistant and more flexible than other epoxies, some three-times more flexible than most. It bonds well to a variety of materials, including dissimilar ones: Plastics, metals, fiberglass, wood, ceramics, rubber and much more. It’s easy to use: Resin and hardener are mixed in a 1-to-1 ratio, by volume. It has a relatively long open working time, yet it cures quickly and can be used in cool temperatures. It gives good adhesion to wet and damp surfaces: It lets you glue to damp woods. It can be used on wet surfaces, even underwater when applied with specific techniques. It gives excellent adhesion to hard-to-bond woods: Domestic and exotic woods that are hard to glue, like white oak, teak, purpleheart and ipe bond successfully with G/flex. It’s great for so much more than boats and boating equipment! You’ll find many more uses for G/flex. Glue and repair leather and synthetic shoes and boots, seal gutters and drains, bond coated and uncoated fabrics. Repair spas, snowmobile and motorcycle fenders, tubs and showers, tool handles, hockey sticks, tennis and racquetball rackets, household ceramics and so much more!